Austria’s 280 tonnes of gold reserves are held and managed by the Oesterreichische Nationalbank (OeNB) which is owned by the Austrian government. The gold reserves are majority stored in the custody of the Bank of England and valued at market prices of the OeNB’s balance sheet. In reaction to the Court of Auditors report, the OeNB announced a gold repatriation program to move 140 tonnes of gold from the bank of England in London back to Austria and Switzerland over a suspiciously slow 5 year period from 2015 to 2020. 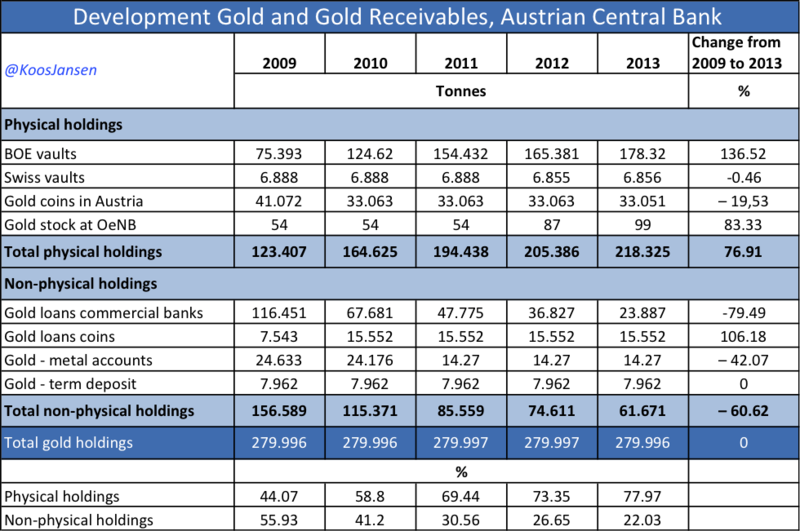 The OeNB was heavily involved in gold lending in the 2000s with over half of the Austrian gold reserves on loan or on deposit as recently as 2009, after which the Bank moved to a much larger share of allocated physical holdings. The Austrian central bank is continually non-transparent about its gold operations and holdings. It claims to have audited its gold holdings in London and Switzerland, but refuses to publish the audit results. It also refuses to publish a weight list of gold bars which it would have used in its audits. Austria holds 280 tonnes of gold in its official reserves, making it one of the top 20 central bank gold holders in the world and seventh largest gold holder in the Eurosystem, just ahead of Spain. The Austrian gold is owned and managed by the Austrian central bank, the OeNB, which is a member bank of the ECB’s Eurosystem. The OeNB holds gold as a store of value, as a reserve asset diversifier, and, in conjunction with the rest of the Eurosystem members, as a stability backing to the Euro. Austria’s gold reserves are fully owned and managed by the Oesterreichische Nationalbank (OeNB). The OeNB is fully owned by the central government of Austria. The OeNB “invests and manage the national monetary and gold reserves” of Austria in accordance with the bank’s “stability mandate”. This mandate is derived from Austria’s NationalBank Act and various EU and ECB statutes. The OeNB in turn fully owns the Austrian Mint, Münze Österreich, which is the National Mint of Austria. The OeNB sold 127.5 tonnes of gold under the first and second central bank gold agreements, wherein its holdings fell from 407.5 tonnes in 2000 to 280 tonnes in the third quarter of 2007. The Court of Auditors report also contained a detailed summary of the OeNB’s gold holdings (physical gold) and gold receivables (claims on gold) over the period 2009 to 2013. 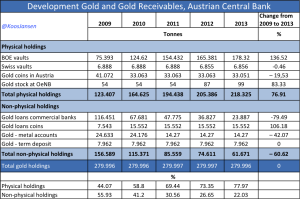 This table highlights that as recently as 2009, the OeNB only held 44% of it gold in allocated physical form, with 56% of its gold ‘holdings’ were in the form of gold lending to commercial banks or within other unallocated products such as short-term gold deposits. The reason for the sharp increase in physically allocated holdings over 2009 – 2013 was due to the decline in OeNB gold lending transactions because of low or negative interest rates. This can be seen in the more than doubling of the OeNB’s physically held gold at the Bank of England from 75 tonnes in 2009 to 178 tonnes in 2013, as the OeNB cancelled or ceased to roll over its gold lending transactions. However, it was this substantial physical holding of 178 tonnes at the Bank of England in 2013 which caused concern to the Austrian Court of Auditors, making them conclude that it was a high concentration risk since it represented 82% of all physically held OeNB gold at that time. The Court of Auditors report also said the OeNB’s internal auditing for it gold was deficient, and it recommended a ‘better dispersion of storage locations’ which was in all probability the main driver that forced the OeNB to devise a gold repatriation program and initiate it a few months later in May 2015. Prior to the beginning of a gold repatriation programme in 2015, the OeNB’s 280 tonnes of gold had a storage distribution across three countries with 80% of the gold holdings (or 224 tonnes) at the Bank of England in London, 17% in Vienna (47.6 tonnes) and 3% in Switzerland (8.4 tonnes). 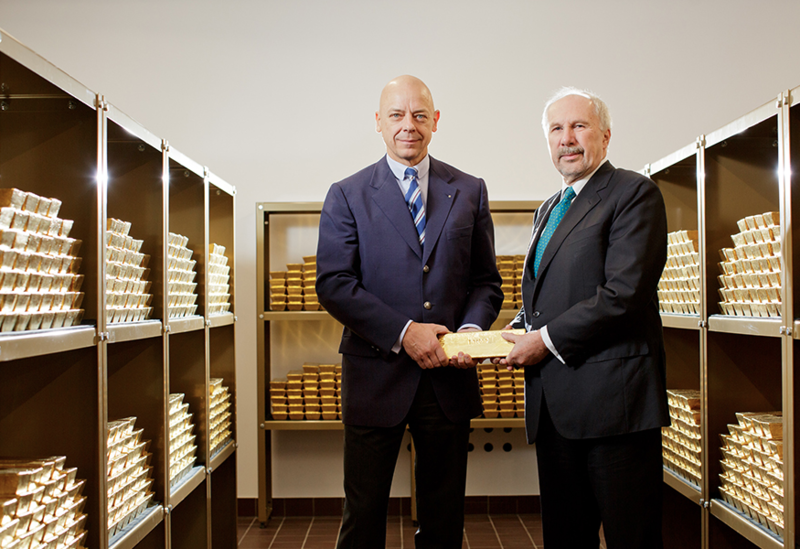 In total the OeNB’s 280 tonnes of gold equates to approximately 22,400 large gold bars. On 28 May 2015, the OeNB announced a plan to repatriate a majority of its foreign stored gold back to Austria. The OeNB claimed it had held a “regular in-house gold strategy and storage policy review” that took into account the recommendations of the Austrian Court of Audit from February 2015 (see above). The outcome of that review was the OeNB’s “2020 gold storage plan” which called for relocating gold from London to both Austria and Switzerland so that by 2020, 50% of the nation’s gold would be stored in Austria (140 tonnes), 30% at the Bank of England in London (84 tonnes), and 20% in Switzerland (56 tonnes). In terms of quantities of gold, the repatriation would entail moving 140 tonnes from London, 92.4 tonnes of which would be moved to Austria, and 47.6 tonnes of which would be relocated to Switzerland. Similar to the German Bundesbank’s gold repatriation, the Austrian plan is shockingly slow and the OeNB has never explained why it could not move all 140 tonnes from London within a shorter time period of time (e.g. within a few weeks) except to state that the storage site in Switzerland (presumably the SMB vaults in Berne) was undergoing conversion work. In such a scenario, the OeNB could always have moved the entire 140 tonnes to Austria, and then move 50 tonnes to Switzerland at a later date, so, like so much in the central banking world, the OeNB’s explanation is not credible. The OeNB stated in May 2015 that the gold repatriation from London was to begin in mid 2015, with updates to be provided in the OeNB’s annual reports, and a comprehensive review of he program planned for 2019. However, in its 2016 annual report, released on 28 April 2016, the OeNB highlighted that it had only repatriated 15 tonnes of gold to Vienna starting in late 2015. which suggests that even before it started, the Austrians’ repatriation plan was delayed. Taking into account the 15 tonne gold repatriation in late 2015, at year-end 2015, the OeNB’s gold storage distribution consisted of 209 tonnes (74.5%) at the Bank of England, 62.6 tonnes (23.5%) stored in Austria, and an unchanged 8.4 tonnes (3%) in stored in Switzerland. The OeNB’s gold is probably all in the form of Good Delivery bars, since on its website it states that “The gold bars held by central banks as reserve assets must meet the good delivery rules of the London Bullion Market Association”. fine ounce (EUR 31,289.91 per kg). The OeNB contributed 22.34 tonnes of gold to the European Central Bank in 1999 at the same time as other founding members of the Euro. This ECB gold is managed on a decentralised basis by each Euro member central bank and is stored in the storage facility where it was stored when originally transferred to the ECB. The OeNB does not state which of its storage locations was used to transfer gold to the ECB, but it was probably from the OeNB’s vaults in Vienna or from its holdings at the Bank of England. According to the Austrian court of auditors reports (see above), the OeNB only devised an audit program for its gold holdings in March 2014. German precious metals website GoldReporter.de reported on 26 May 2014, based on an earlier report in Austrian magazine ‘Trend’, that the OeNB was “planning to send auditors to the Bank of England in order to verify the existence of Austria’s gold reserves stored in british vaults”. This audit visit actually took place on 22-23 May 2014, when the Austrian auditors undertook an on-site review of its gold reserves at the Bank of England vaults. The Court of Auditors report stated that this review identified a sample of 300 bars in advance using a gold bar weight list. Then during the visit these bars were visually inspected for their unique markings of fineness, year of production, refinery brand and bar number based on the weight list. Then 60 bars were selected which were weighed and subject to an ultrasonic inspection by the OeNB. “We can confirm that the Oesterreichische Nationalbank has audited her gold holdings in the UK and also in Switzerland, but we also have to tell you that we won’t send a copy of the audit reports…I regret, we do not have the required gold bar list online.”. The OeNB has a full bar list of its gold bar holdings which includes refiner brand, year of manufacture, fineness and bar number, since such a list was used in advance of the Austrian auditor visit to the Bank of England vaults in May 2014 to visually test the gold bars during the sample audit. By not publishing this gold bar list information and by not even explaining why it will not publish this information, the Austrian central bank is proving yet again that like nearly all central banks, it operates with non-accountability to the public, in particular to the Austrian public.